In this totally tubular episode, we watch “Splinter No More” from season two, episode nine of the Fred Wolf cartoon over a mega slice of California sushi roll! Thank you all for listening and cowabunga! 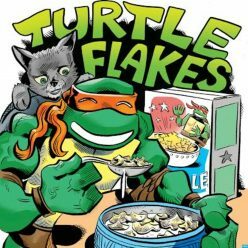 Turtle Flakes is also proud partners with The Retro Gaming Times, the longest running free online magazine dedicated to classic games and electronics. “TMNT Cartoon Theme” Performed by Daniel Tidwell. “9.95” by Spunkadellic and “T.U.R.T.L.E. Power” by Partners in Kryme. Here’s to hoping to enjoy your family, enjoy your friends, and, as always, enjoy your pizza. Talk to you next week!